Need inspiration? Our samples give perfect guidelines for you to follow to make the best application for your industry. Use our writing guides to land more interviews, faster. These templates are minimalist, yet highly effective. If you want to play it safe with a battle-tested template, this choice is for you. These templates are straight from our resume builder. If you're looking for a professional aesthetic that's guaranteed to impress hiring managers from all industries, you can't go wrong with our professional resume template library. Modern resume designs and formats are the perfect choice for job hunting in 2019. Pick one from our modern resume template library today and land more interviews. Looking to add a little flare to your resume? Our assortment of creative templates will give your resume the pop it needs to stand out from the other applicants. Don't know the basics? Learn from this comprehensive guide. Leave questions in the comments and we'll respond within a day. Your template's looks shouldn't be important, but it is. Learn how to make a beautiful template that will leave hiring managers saying, "wow!" Browse through our library of industry-specific cover letter samples. Get inspiration on how to create a cover letter that fits your career path. Download the ones you like and simply add your own information. Use our cover letter writing guide to learn how to format it for applicant tracking systems. Don't forget to download our cover letter checklist to discover what you might be missing. Create a convincing cover letter in minutes with our state of the art software. Our builder knows exactly which template you need to use based off of your work and personal life situation, then you just fill in the blanks. The visual appeal of your cover letter is almost as important as the content. These beautiful and battle-tested cover letter templates will help you stand out to any hiring manager. Action verbs give your resume "oomph." Use our 'longest action verb list in history' to give yourself a boost. Browse our database of free resignation letter sample and templates. To write the best resignation letter possible, customize our templates, or use our tips to write your own. Just how should you answer those confounding interview questions? We constantly update this list of common interview questions and answers to ensure you're as prepared as possible. 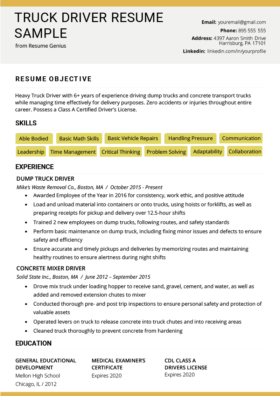 Struggling to make the perfect warehouse worker resume? Look no further than our downloadable sample and resume writing tips below! If you want some extra guidance, try our easy-to-use builder. Not in love with this template? Browse our full library of resume templates. General warehouse laborer with 4+ years of experience in warehouse operations. Avid on-the-job learner excited to apply acquired knowledge while advancing skill-set for the benefit of assisting with the growth of Forsyth Manufacturing. Working in a warehouse is a position that requires much more than simply moving boxes around. While it’s true that loading, unloading, and moving packages is a large part of what a warehouse worker does, it’s not the only task they perform. There is also a large range of qualifications required depending on the level of position for which you’re seeking to gain employment. Entry-level package handlers are usually only required to have the ability to lift a specific weight, like 60 pounds, while a supervisor would most likely need reasonable PC skills for arranging schedules and working with digital inventories. Regardless of the level of position you are applying for, you’ll want to have a professional and well-written resume. Did you know that according to payscale.com, those working in a warehouse make an average of $11.74 an hour? Many warehouse positions don’t require a higher education, but some do, and almost all of them require at least a high school diploma. That means you should definitely include an education section. The main purpose here is to show that you do have, at a minimum, the necessary requirement for the position you’re applying for. Adding your GPA is okay, too, as long as it was fairly high. Otherwise, just listing your school, what you graduated with (high school diploma or field of study for a university degree), and the date you completed your studies is enough. For warehousing, the additional skills section is usually more important than the education section. Make sure you have one. But, as mentioned earlier, don’t get overly rambunctious and start listing skills that you do not actually have. A very easy way to show a hiring manager that you are not just looking for any job but want to specifically work for their company is to target your resume to each particular company you are attempting to land a job with. Luckily, it isn’t nearly as daunting of a task as it sounds. The trick is to use an easily editable career objective. This is exactly what our applicant Byron Turner does. His career objective starts in a very standard way that is acceptable for any company that he applies to. However, the following sentence goes into a little more detail about what position he is looking for. Looking forward to join your team. Avid on-the-job learner excited to apply acquired knowledge while advancing skill-set for the benefit of assisting with the growth of Forsyth Manufacturing. This type of fine-tuning really makes your resume stand out from all of the generic ones that pass through HR offices. Also, matching the wording of your career objective to the exact same wording that each specific company uses on their job posting is great for two reasons. First, it ups the chance your resume will make it through an applicant tracking system should the company use one for prescreening. Second, it shows hiring managers that you did at least a little research into what they are looking for and that you’re not just mass applying all over the place with the same generic resume. Spending a few extra minutes making these minor customizations greatly increases your chances of getting called in for a face-to-face interview, which, of course, is the first step toward getting hired. Not sure how to introduce your own resume? Our simple flow chart infographic will tell you how to start your resume. People working in human resources departments love to see numbers on resumes, as it helps them quantify applicants’ experience and accomplishments. Unfortunately that isn’t as easy for those in the warehousing industry as it is for people in fields like finance. That doesn’t mean it is impossible though. You just need to get a little creative. “Creative” does not mean “lie.” Always be honest on your resume. Having a job offer rescinded because an employer discovered inaccuracies is not something you want to experience. It can also harm your reputation and career. Byron Turner quantifies his experience in a couple of different ways. One way is that he shows he is responsible for new employees’ acclimation and training for a set time period. Aside from the fact that this bullet point shows he has some supervisory responsibility, it uses the specific number of 3-months. The use of the number both acts as a honing beacon for hiring managers’ eyes, and also as a way to quantify just how long he is responsible for each new hire. Byron also understands that although he does have some supervisory tasks, he is not a manager. Thus, he doesn’t really have the title or means to mention budgets or other easily quantifiable financial numbers. Instead, he sites a very important number that anyone working in a warehouse, from a part-time loader to a warehouse manager can understand. In an industry where workplace accidents are all too common, having a quantifiable measure of safety is extremely important. And, instead of simply mentioning that he was accident free, Byron makes sure to use hard numbers. It’s not always easy finding a way to squeeze some numbers into a resume for a warehouse worker, but even using this type of quantified bullet point once or twice makes a big difference when compared to generic nonspecific ones. Like the list above? There’s more where that came from. Check out the longest action verbs list in the universe! 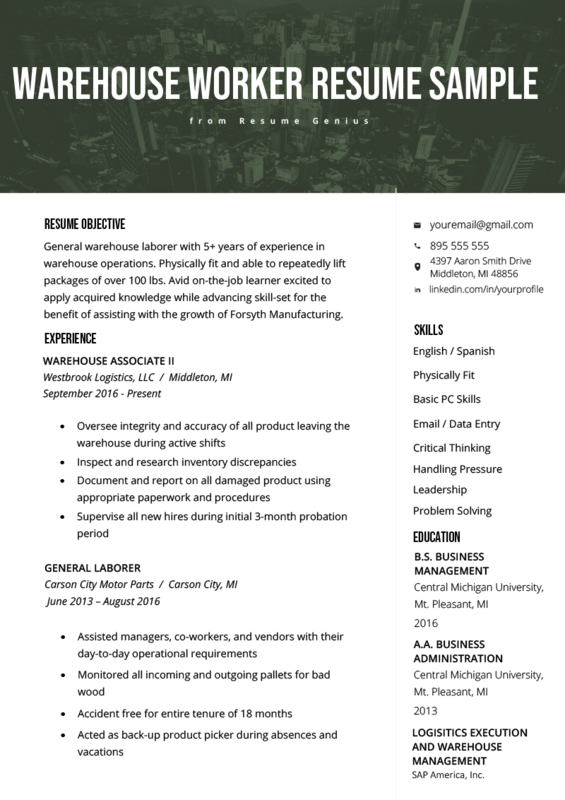 Spending hours upon hours making your resume for an entry-level warehouse position might seem like a bit of a chore, but you will definitely want the highest quality resume you can make for more advanced positions. Also, if you are chasing an entry-level position now, you won’t be in a couple of years. 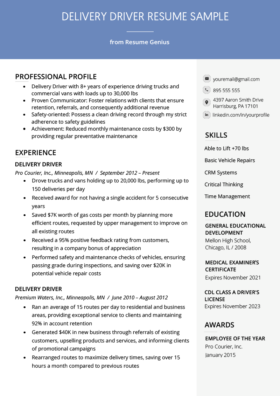 Having a quality core resume to build off of when you gain more experience is absolutely worth the time investment now. We’re looking forward to hearing your thoughts! Please keep in mind that all comments are moderated, and abusive or spammy comments will NOT be published. Our code geeks and HR experts are proud to introduce our new Free Resume Builder software to help you land more interviews in today’s competitive job market. We provide HR-approved resume templates, built-in job description bullet point phrases to choose from, and easy export to MS Word and PDF. Want to save yourself some time? Build your resume in just 15 minutes! ResumeGenius.com is owned by Resume Technologies Ltd. and operated by Resume Companion LLC, with offices in the U.S. and Europe.